The refund process described below will work for both online and standard payments. Online payments are any credit card payments , and in some cases it will include ACH/Pre-Authorized Debit payments, that have been automatically processed through a payment gateway. Standard (or manual) payments include offline credit card or offline debit payments, cash, checks, or other payments that have been taken in manually. When refunding a credit card transaction, you must first locate the transaction you plan to refund from the transactions tab, from the appeal, event, or constituent’s detail page, or by searching. Begin from the transaction detail page. Locate the related list of payments, and examine the list to ensure the payment you plan to refund has not yet been refunded. If it has been refunded, a second payment for the same amount will exist, with a status of “Refunded”. If the payment has not yet been refunded you can continue. 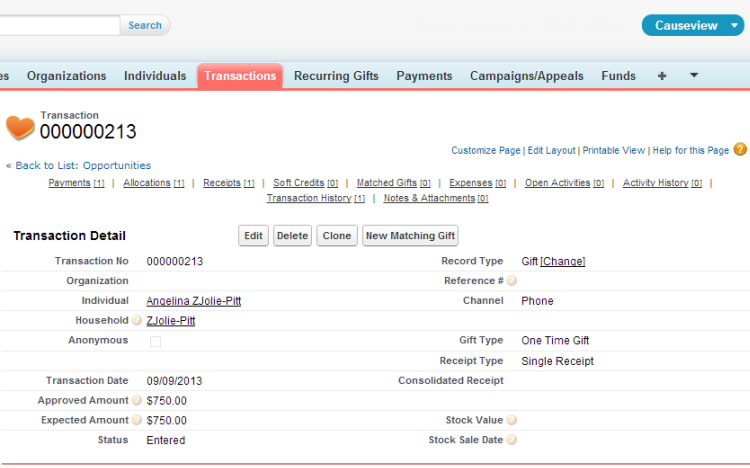 From the related list of payments, open the payment record by clicking on the payment number. At the top of the payment detail page for the payment, you will find a “Refund” button. 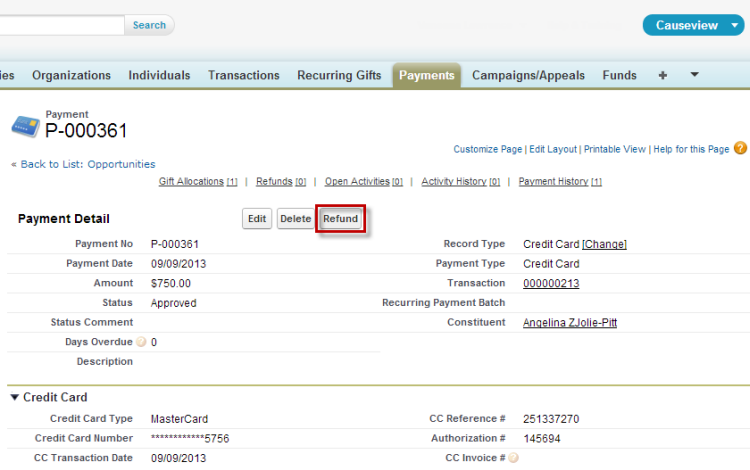 If you do not see the Refund button, you may need to edit your page layout and add the Refund button to the page. The refund button will automatically issue a refund at the payment gateway if it is an online payment. When you refund a payment, Causeview creates a refund-type payment based on the original payment. The button will open a refund creation page where you can specify the amount and reason for the refund. The amount will be automatically filled in with the full value of the payment you are refunding. Specify a reason for the refund using the picklist and save the refund. Causeview will communicate with the payment gateway and process the refund automatically for online payments. Once it is complete, the app will inform you that the refund is successful. Click on the link to return to the transaction and continue the refund process. From the transaction detail page you can now see that see that the approved amount of the transaction is $0.00, while the expected amount still corresponds to the original payment amount. A second payment is shown in the payments related list, with a negative value equal to the original payment - note that negative values in Causeview are marked by enclosing an amount in parentheses. An associated allocation is also created with a negative value.